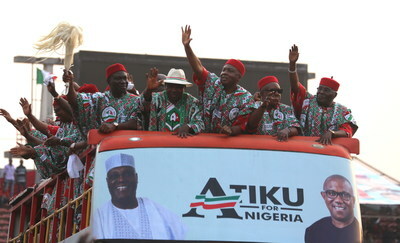 LAGOS, Nigeria, Feb. 1, 2019 /PRNewswire/ -- The Deputy President of the Senate, Senator Ike Ekweremadu, has said that the sense of belonging given to the South East region and infrastructural developments in the region under the Peoples Democratic Party, PDP, were enough reasons the geopolitical zone would return the party to power in the forthcoming general elections. He said: "Today, we have assembled to showcase our love for the PDP. And we have reasons to do so. "PDP is the party that gave our people the President of Senate of this country. They gave us Deputy President of the Senate. They gave us the National Chairman and Secretary of the PDP. They gave us the Governor of the Central Bank of Nigeria, CBN. They gave us the Minister of Finance. They gave us the Chief of Army Staff for the time since after the civil war. They gave us the Inspector General of Police. In fact, they gave us a sense of belonging. "But since the PDP lost power at the centre, we lost all these. Now, we are going back to power. Now, we are believing that with our own son as the Vice President and our sister as the First Lady, we will return to power. So, this is down to our people." In terms of infrastructure, Ekweremadu said the PDP started the Second Niger Bridge, that the PDP also gave the South East "access to the international community through the international airport, just to name but a few". "So, the PDP has done so much for us, but the good news is that the party is even ready to do more for us. "Therefore, when we go to the polls on 16th February, we will vote Atiku Abubabar as President and Mr. Peter Obi as his Vice President, and return all the PDP candidates to the National Assembly. We will do the same on 2nd March and return our Governor, Ifeanyi Ugwuanyi, and all our House of Assembly candidates," he added.